In Athens, we will be staying for 2 nights at the boutique Divani Acropolis Palace. Offering breathtaking views of the Acropolis from its rooftop terrace, the hotel is ideally located a few minutes' walk from the Acropolis, the new Acropolis Museum, and the Herodion Theater. This first class property was constructed around the ancient ruins of Themistocles wall, tastefully incorporated into the hotel's elegant design. 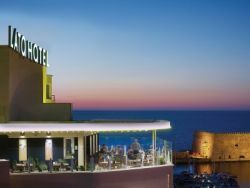 The hotel features an outdoor swimming pool as well as two on-site restaurants, one located on the rooftop terrace, serving both Greek and international dishes. The 250 rooms are decorated with classic furnishings and feature free Wi-Fi, flat-screen satellite TV, air conditioning, in-room safe, mini bar, desk, room service, and luxurious bathrooms with a shower, bath tub, hair dryer, and boutique toiletries. In Santorini, we will be staying for 3 nights at the Volcano View Hotel. Built in the style of the traditional Cycladic architecture, Volcano View Hotel blends perfectly with the surrounding Aegean landscape. The hotel is located just five minutes from downtown Fira, the charming capital of the island. Suspended in tranquility between the sea and the sky, its location offers some of the world's most breathtaking views. 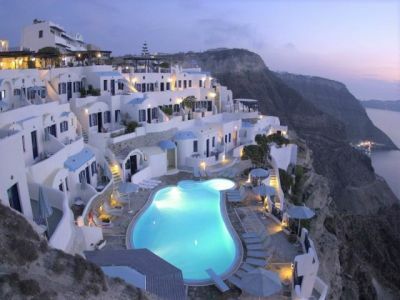 The hotel consists of 82 guests' rooms with private balconies or terraces overlooking the sea and the volcano. All rooms are equipped with individual climate control, satellite TV, music, kitchenette, wireless Internet access, direct dial phone, safety deposit boxes, and hair dryers. The hotel has a restaurant, coffee bar, pool bar and a snack bar. There are three outdoor swimming pools located on different levels of the hotel, cascading down the Caldera. One of the pools has a hydro massage. In Heraklion, on the Island of Crete, we will be staying for 1 night at the boutique Hotel Lato. Hotel Lato is situated across from the old Venetian Port, and right next to the Archeological Museum of Crete. The hotel is fully air-conditioned, offers a modern lounge, two elegant restaurants, a roof terrace and an excellent breakfast buffet, bar with a fireplace and a snack room. The property offers room service, business center and laundry and dry cleaning services. Most of the hotel's 50 rooms have a remarkable view of the Venetian Castle at the Old Port of Heraklion. All rooms have private bathrooms, and are sound insulated and equipped with independent air-conditioning, Satellite web browser TV, direct-dial phone, high speed Internet, mini-bar, hair drier, a balcony or a terrace. In Chania, on the Island of Crete, we will be staying for 4 nights at the Minoa Palace Resort. 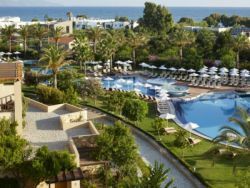 This modern design beachfront hotel is situated in the cosmopolitan area of Platanias, west of the picturesque town of Chania and offers majestic views of the sea and the White Mountains. To the north, the hotel enjoys panoramic views of the endless golden beach of Platanias with the shimmering sapphire blue Aegean beyond. The hotel offers 4 outdoor swimming pools, 2 open-air jacuzzi, gym, jewelry shop, mini market, conference center, tennis and mini football court, 24-hour room service, laundry and dry cleaning, and an extensive spa and wellness center. All rooms feature individually controlled air conditioning/heating, direct dial phone, tea & coffee making facilities with daily refill, electronic safe box, high speed Wi-Fi Internet connection (through DIA line), satellite TV, hairdryer, mini bar and afternoon turn down service, and marble bathrooms (with phone), sitting-room and elegant furnished balconies or terraces.